Besides being one of the most prestigious universities nationwide, the University of California, Los Angeles contains a number of picturesque photography locations for the couple that wants to take a walk down memory lane taking a walk down the aisle. As you wander around the campus with your bridal party and wedding photographer, you'll find countless opportunities to take pictures in front of buildings like the magnificent Royce Hall. The cover for just about every University of California, Los Angeles brochure, Royce Hall is approached by the expansive Dickson Plaza - a great location for a photograph of the entire bridal party. Take advantage of the lush green lawns surrounding the plaza or explore the college's renowned Mathias Botanical Gardens. The latter will add a wonderful, vibrant backdrop to your wedding photography session. Take your time in discovering (or rediscovering) the sweeping expanses of the university grounds and you'll find plenty of perfect spots to stop and take pictures. After you've finished exploring the campus, take a ride in your limousine along the brightly-lit Westwood Boulevard, a center of night-life in Los Angeles. Your party will be sure to turn some heads while your wedding photographer captures all the fun from street level. Whether you're college sweethearts or just devoted natives of the city, you'll always remember these fun-filled hours in downtown Los Angeles. Considered the cultural epicenter of the San Gabriel Valley, Pasadena contains some of the most popular wedding hotspots in the Los Angeles area. For an elegant start to your wedding photography session, visit Castle Green- a renowned Pasadena wedding venue. Here, your photographer will find countless beautiful places to arrange the bridal party. Take a gentleman's photo in front of the fireplace in the luxurious Salon Room or seat the bridesmaids on the comfortable ottomans in the Moorish Room. The building's lush Garden is perfect for a photograph of the entire party. After you've finished your photography session here, take a leisurely stroll down the block to Pasadena Central Park. 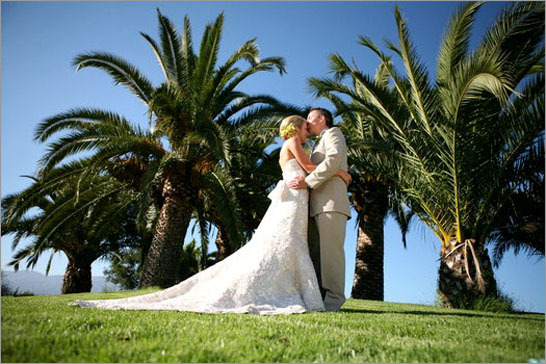 Listed on the U.S. Register of Historic Places, the park offers numerous verdant lawns for group pictures, as well as clusters of towering palm trees that your photographer can employ as a backdrop. 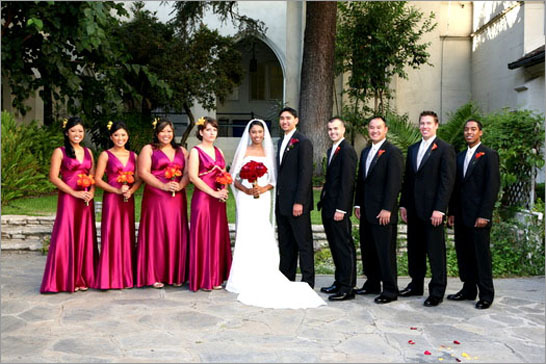 Finally, have your limousine take the bridal party to Pasadena City Hall, only a few blocks northeast of the park. The building's stunning Mediterranean-style architecture will provide a spectacular backdrop that your photographer will hasten to take advantage of. Take pictures beside the columns at the entrance or venture inside for some photographs near the fountain. 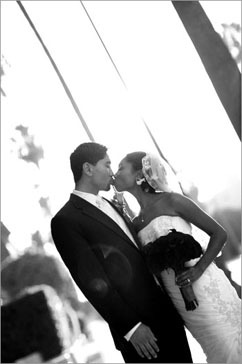 Having finished here, you'll be glad to have chosen Pasadena for your wedding day photography session. The coastal city of Long Beach has always been a southern California favorite for couples wanting to tie the knot in the Los Angeles area. For starters, have your limo driver take the bridal party to the charming Hyatt Regency hotel, located just minutes from the waterfront. Your wedding photographer can snap some shots in the lobby, with the party seated at the bar or assembled along the length of the front desk. Afterward, step outside and take some photographs at the entrance with the dazzling glass-covered hotel or the shimmering water as a backdrop. You can then make your way toward Rainbow Harbor, where you photographer will take pictures as you walk along the palm-tree laden shoreline. In the late afternoon, the gentle sunlight will hit the water just right, creating a truly romantic backdrop for an intimate portrait of the bride and groom. Finally, amble over to the gorgeous Queen Mary ship - one of the most famous historic sites in all of Long Beach and a popular choice for Los Angeles weddings. The Queen Mary has numerous luxurious accommodations for wedding ceremonies and receptions, but even if you're not planning on getting married aboard the ship, the Queen Mary is still a great photography spot. Your wedding photographer can take pictures of the bridal party spread out along the steps leading to the hotel boat. The elegant wooden deck and railing, combined with the breathtaking view of the coast and city, will provide the perfect conditions for a photograph of the happy couple. Once you've explored the Queen Mary to your heart's content, have your limousine driver pick you up and get ready for the rest of your unforgettable day in Los Angeles!